Madagascar is featured in this Moderate Resolution Imaging Spectroradiometer (MODIS) image taken by the Terra satellite on Sept. 10, 2003.The narrow strip of green along the east coast of the island is a rainforest. A thin section of one fragment went through microscopic analysis, enabling Gibson and Lewis Ashwal at Wits University to confirm its space origin. 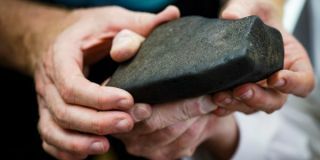 Other supporting evidence for the meteorite's provenance came from work done by Matthias Laubenstein at the National Institute for Nuclear Physics in Italy, who found evidence of recent cosmic ray exposure — meaning the fragment was outside Earth's protective atmosphere as recently as a few months ago.